Bedding truly makes or breaks any bedroom design! If you wish to give your bedroom an entirely new look or feel, then consider a new bedding set. Choose your favorite design style such as Traditional, Contemporary/Modern, Casual, Country, and Western/Southwestern, then choose the color or print that will work well in your space. To finish off your new bedding, top it with decorative pillows or throw blankets to add texture and even more interest. Quality bedding will last for years, and you can update the look with accessories such as pillows, a new sheet set, and the surrounding decor in your bedroom space. If you're like many people, you enjoy changing the look of your bedroom seasonally, or at least a couple of times a year. A fresh bedding set can help you to do just that. Use light colors for spring and summer and darker colors for fall and winter, or use holiday themed bedding sets for Halloween, Christmas, etc. Your bedroom is yours to create any theme or color scheme you desire! Have fun and make it your own. ​Sheetsnthings proudly offering a beautiful 8 pieces Goose down bed in a bag set. Sleep in luxurious comfort with this Goose Down comforter set Features 100% cotton, 300 thread-count cover Sateen Striped Features an extremely soft touch and outstanding durability 650 Fill power Box stitch construction keeps fill evenly distributed * Royal Tradition * Four Seasons * California King: 106 x 90 inches, 32 oz. fill * 650 Fill Power * 300 Thread count cover * 100% cotton cover * Allergy Free Down and feather-filled products are packed tightly during shipping. Upon receipt, remove them from their packaging, fluff gently, and allow several hours to recover their full loft. In addition, being sealed in plastic packaging sometimes causes the scent of these natural products to concentrate to a disagreeable level. A few hours of airing usually removes the odor. In addition to the beautiful goose down comforter, your also receiving 100% cotton 300 TC duvet set with the matching standard shams plus a beautiful 300 thread count cotton sheet set with the matching pillowcases. This casual comforter uses warm tones of brown and blue to create a fun leaf print. 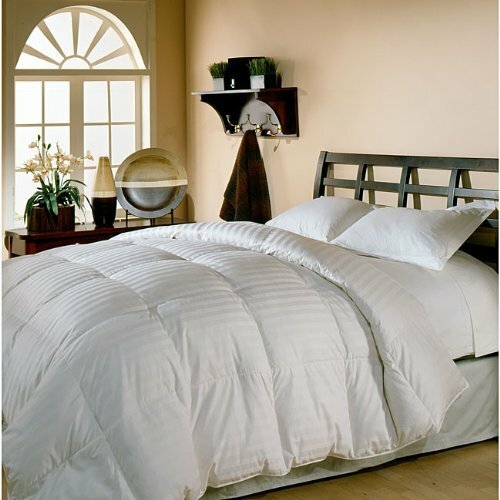 The comforter features an ivory border along the edge to create a finished look. A solid blue color covers the reverse. The set also includes two standard shams and three embroidered decorative pillows in brown, khaki, and blue that accents the colors on the comforter. This type of bedding provides a sophisticated, classy style that is perfect for master bedrooms. It is generally modeled with elegant motifs and designs. Traditional sets may be created in an array of colors, but dark, rich tones are more common. ​Look for bedding made of jacquard or damask print to create a traditional feel. A rich combination of silver & gray hues and interlocking geometric patterns provide contemporary appeal. Five Star luxury for less of the cost. This comforter set adds a modern flair to any bedroom. You can even add to the collection by adding our Exclusive matching Wireless Thermal Pressing Coverlet that is available in 8 piece combo set. 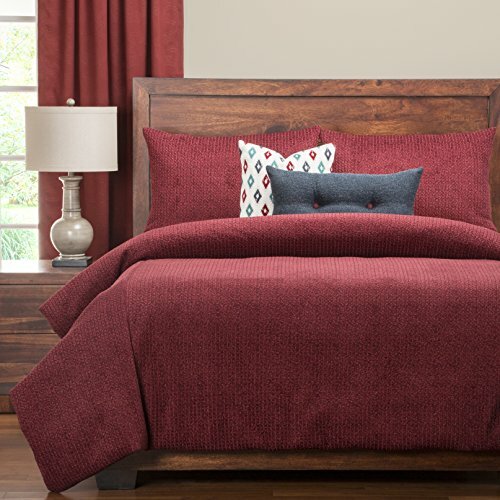 Featuring gorgeous shades of deep red woven and tumbled in soft, sweater knit pattern this PoloGear Tumbleweed Crimson duvet cover set is sure to bring a unique, stylish look to your bedroom decor. A soft polyester construction is backed with an ultra-soft sheeting material giving this lovely bedding the perfect combination of comfort and style. The duvet cover set comes with an eco-friendly down alternative comforter insert with a medium-weight fill made from recycled plastic bottles and will keep you warm all year round. The comforter has a polyester cover that cleans in the washing machine while the duvet cover and shams have a zip closure for easy removal and cleaning. The comforter also buttons in eight places to ensure it does not shift in the cover. This bedding is known for its use of popular colors and trendy designs. The fashion forward style of contemporary and modern bedding will give a bedroom a fresh, vibrant look and feel. ​If you need to revitalize your bedroom or bring in some energy, then this is the style to choose. Solid sophistication meets casual elegance in the subtle cotton weave textured fabric used for this ensemble. The weave pattern mixes ivory and neutral khaki in a small-scale raised grid that creates an updated Pique effect with a relaxed attitude that will complement any bedroom. The brand's signature marlin appears as a tonal embroidery on the standard shams and comforter corner. Flange borders edging the comforter and shams add a soft tailored finishing detail and woven and embroidered decorative pillows add an unmistakable Tommy Bahama accent. The Whistler 3 piece set features a soft velvet which is pieced with a diamond stitched quilt pattern, and is accented with a cable knit weave and handsome flannel plaid. The collection is a wintery mix of Gray, black and cream. Comforter set includes 1 sham, comforter, and a bed skirt . Comforter:face:100% Cotton/Back:100% Cotton/Filling:100% Polyester;bedskirt: Skirt:100% Cotton/Decking: 100% Polyester;standard Sham: 100% Cotton. ​Casual bedding often includes a whimsical pattern, such as stripes or polka dots. Colors like beige, tan, and brown are often associated with this style, but they can range from soft pastels to deeper tones. Pastel casual bedding is great for teen bedrooms because they can make the transition from child to young adult and still look fresh. This is excellent bedding for guest bedrooms as well. When it’s time to rendezvous with the rustic, just follow the arrows to Bear Country, where the lumbering, black bear lives in the shadows of the cool, stately pines. An earthy, brown background perfectly showcases the colors and artistry of bears and pine trees, patterns and lines. Carstens’ Bear Country set is a wonderfully warm choice for every creature of comfort! Bed skirt is tailored, faux suede with antique brass rivet accents. Bear Country shams with bullion fringe, zipper closure. Faux suede shams, with red velvet ends, accented with rivets, and zipper closure. Throw pillow is Bear Country center, red velvet ends, with decorative gimp and bullion fringe. Decorate your master suite or guest room with Bouvier; a stylish and fashionable Toile bedding ensemble. An exclusive design by Thomasville, the Bouvier Bedding Ensemble features scenes from a herders album that are sketched in Black on a Ivory ground cotton duck. The coordinating bed skirt is a melange of delicate leaves scattered on a textured ground. The standard and king shams repeats the same pattern from the comforter and features a flanged edge. The Face fabric is 100% Cotton and the Back of comforter is 100% Cotton. Dry clean only. Country style decor is a popular design style that goes well in your home, your cabin, and even your beach house. From patchwork and ruffles, to warm colors and animal prints, you'll love country bedding! ​ Country style is wide-ranging and often depends on geographical location, but is generally exemplified by primitive furniture, muted colors, milk-paint finishes and vintage fabrics. Colors may included soft, muted designs, and can also show the wear of time which is indicative of a rustic country style. The Calhoun Ensemble by HiEnd Accents Vibrant serape-inspired stripes anchor this appealing set, which is perfectly paired with understated stripes, rich faux leather and soft suede. Turquoise accents provide the finishing touch. 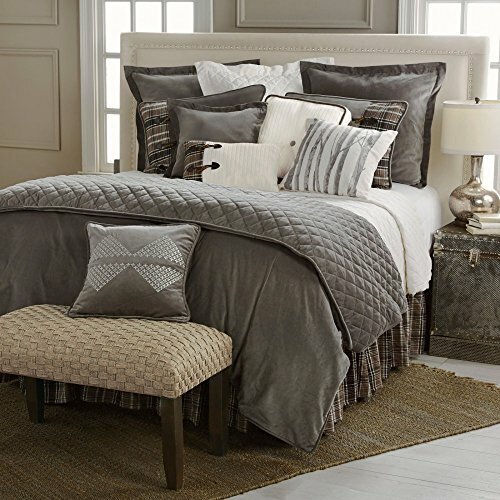 The five-piece Calhoun comforter set includes: Comforter, Bed skirt, Decorative Pillow and Two Pillow Shams (Please note, the twin set includes only one pillow sham). The Lifestyle Rustic Collection by HiEnd Accents offers affordable luxury to those seeking a fashionable rustic look in their home. 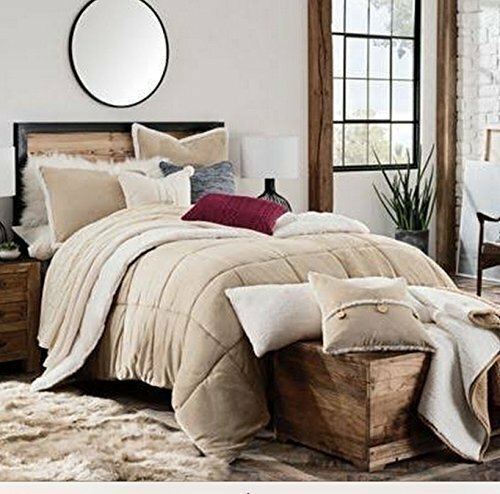 From quality window treatments, to decorative accessories, dinnerware and bedding, the Lifestyle Rustic Collection provides the details that bring style and comfort into a home. * 5 Pc Super King Comforter Bedding Set: [1 Comforter, 2 Pillow Shams, 1 Bedskirt, 1 Neckroll Pillow ] - The Bedding Set and Bedding Accessories are made from a Polyester/Cotton Blend. Dry Clean Only. - The Bedding Set and Bedding Accessories are made from a Polyester/Cotton Blend. Dry Clean Only. 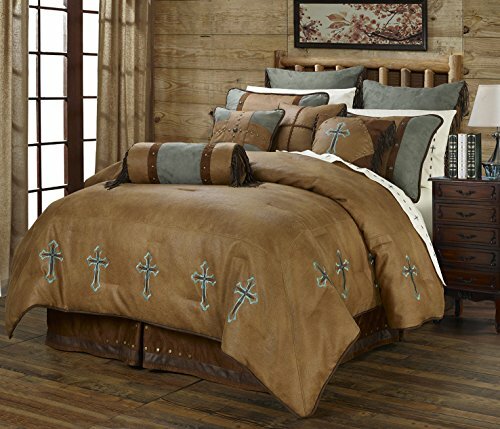 Turquoise Cross Western 5 Piece Super King Comforter Bedding Set Includes: (1 Comforter, 2 Pillow Shams, 1 Bedskirt, 1 Neckroll Pillow) - SAVE BIG ON BUNDLING! 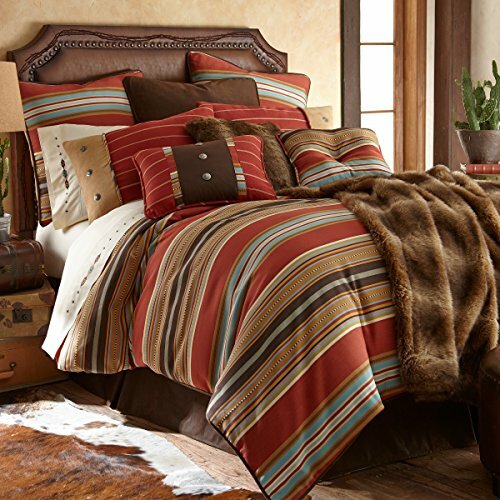 When you want to bring the Wild West or South West into your bedroom, this style will help you accomplish your goal. this bedding varies in color, ranging from brown and red to teal, green, and blue. Often it will include patterns of wildlife, cacti, stars, stripes, plaids, and more.